Correct. Only foods with rarities between 90 and 100 count as Gourmet Foods. Items you get from site activities (which previously didn't exist) are usually r101+. There's nothin' wrong with this in the slightest. Write away, good Neopian. Write away! After shouting different pronunciations back and forth across the office, we think we settled on "um-uh-gene." Adding things to the pronunciation page is rather low on our to-do list at this time, but maybe someday! Ahh, that's a tricky subject, and not one that lends itself easily to black and white rules, as such subject matter often falls to a judgement call on a case by case basis for any entries to our writing contests. Maybe we can supply some examples that will help you differentiate for yourself? Just fine: "His parents passed away when he was just a pup, leaving him alone in the world." Limit: "His village was attacked by vicious Bearogs when he was just a pup. He was the only survivor." Too far: "His parents were murdered by vicious Bearogs that tore through his village, killing everyone but him." Basically, if you have to include it, keep it tame. If you wouldn't want to read it to your young sibling or small child, then you'd best avoid it or word the story differently. Each of the Nickelodeon Virtual Worlds may have specific rules regarding how to play the games and interact on the particular site, but all the Nickelodeon Virtual Worlds share certain core principles regarding appropriate behavior. These Rules of Conduct are those shared principles. Please do not take this as a sign that we don't want you here! 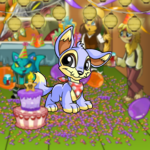 Neopets itself is family-friendly (and always has been family-friendly), which may sound a lot like kid-friendly, but it's quite different. Rather than provide content made especially for younger kids (kid-friendly), we provide content for all ages while refraining from anything that would be inappropriate for younger players (family-friendly). Basically, we want everyone to have fun, and want to provide content everyone can enjoy, including us! *ominous plot music plays in the background* We certainly aren't trying to get rid of anyone (except for the kid who teased Viola in the second grade -- you know who you are), and we'll continue to do our best to make the site fun for everyone, regardless of age. People of all ages play Neopets, and we <3 them all. Neopets-specific rules will make their return on a new page. There have been whisperings that faerie magic is involved with that particular little plushie, and without the faeries around, we're afraid he's not up to visitors. *expectorates coffee all over the computer monitor laughing* BAHHAHAHAHHAHA! We mean, er, no... of course that's not a spelling error. *shifty eyes* We just want to be sure to win the annual "Farthest Spitting Employee" championship trophy this year. If you can spit over 6 metres, please apply! Note: Please don't actually send in resumes for spitting distance. Our Human Resources Manager will track us down and harm us. Repeatedly. It appears even mr.coconut has dedicated a moment of silence to the beloved pie.